I have completed this loop many times but never written about it before. I start from Knockmoyle where I live, but Newport would be a good place for a visiting cyclist. Invariably I cycle in an anti clockwise direction, why I don’t really know, perhaps the views are more enjoyable when cycled this way, but I am not sure if this is so. Just after leaving my house I meet the monument to the West Mayo Brigade, or perhaps more correctly the West Mayo Flying Column. The monument commemorates the actions of the men as they retreated from the Kilmeena ambush, an ambush that had not gone well from the column. The Black and Tans had used Skerdagh School as a covering position as they sought out the IRA men in the villages at the foot of the mountains. The IRA men eventually made their escape into the hills beyond. These mountains, Buckoogh, Birreencorragh Mount Eagle would provide cover. I would be cycling through them on my return journey. The Nephin Beg Mountains as they are called are mainly composed of quartzite. There is extensive coverage of blanket bog right to the tops of many of them. There are forestry tracks and trails winding their way through the mountains and two major hiking trails The Bangor Trail and the Western Way make their way there as well. 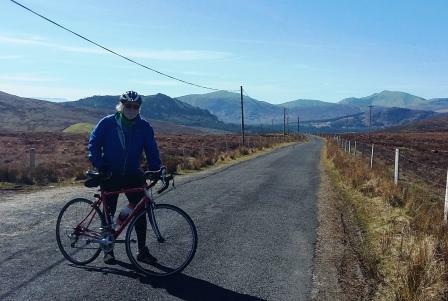 The Western Way can be cycled with a mountain bike; I have cycled from Newport to Ballycastle in North Mayo using this long distance trail, a tough day but a great day. 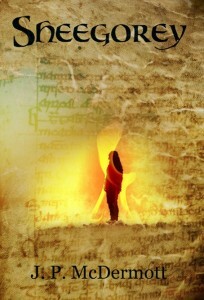 I must write about it sometime. Back to the Keenagh Loop, there are no climbs to face for the first 26 Kilometres. Yet the small gradients begin to add the metres to the overall height gain. The R317 leads the cyclist through Cloondaff with its small church and school, and further on is Glenhest Hall, many a good night was had here. There is a good sense of community here with such rare activities as Tai Chi available to those who would like to participate. 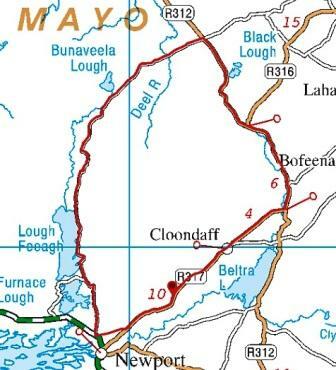 Further on and just before joining the road from Castlebar the Crumpaun River is crossed, it flows into Beltra Lough and from the lake it flows towards Newport as the Glaishwy River and later still it becomes The Black Oak River, before entering Clew Bay at Newport. Turn north on the R312 toward Nephin. This majestic mountain whose name is somewhat unfathomable, there are many suggestions for its meaning but none definitive. My favourite is place of Sanctuary; others suggest it to be the name of some Goddess. Perhaps it is named for a goddess who gives sanctuary. The ice age gouged a great circque from the northern face though not easily visible on this trip. Just to the north west of Nephin is Tristia 322 metres compared to Nephin 806 metres. Tristia is a difficult one to translate. Bishop McHale blessed a holy well on the side of Tristia and called the hill Mount Jubilee. There is a fine loop trail whose trailhead is just at Bellanaderg to the left of the road, before the Crossmolina turn. A short while after you pass the turn for Crossmolina, the R316, you pass an old school not recognisable as such today it served for a time as a community hall but appears now to be abandoned. There was a Royal Irish Constabulary barracks here as well it is now a private house. 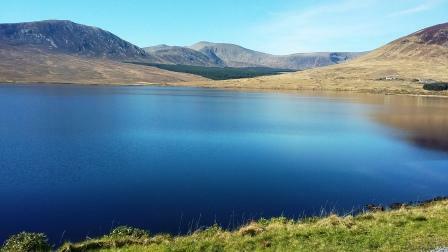 A little climb brings you by Drumleen Lough and Black Lough and other hiking trails. I like to think that you are now entering the north Mayo uplands, a vast area of blanket bog that stretches north and west for miles and miles. When you turn left here you are in Keenagh, I named this cycle after this place. You shortly pass the church of the Holy Souls; I think of souls wandering the hills and valleys hereabouts, the bleak majesty of this landscape in winter, the sun shining summers as the purple heather blooms behind the fuchsia hedges that line the roadsides before giving way to treeless hills where the winds seem to blow forever. I cross the Deel River that rises just below Birreencorragh, hard to imagine that this small river can flood the town of Crossmolina some thirty kilometres away, but then it drains such a vast plain as it meanders towards the town and eventually looping around to empty into Lough Conn.
And then the old Keenagh School, now replaced with a nice new one back beside the church. I like to stop here before facing the climb. I have 100 metres to climb some of it in short steep sections over 7% by the end it is a slow drag to the top, the gap, and Bunaveela Lake below. Wind blows; I hunker down behind whatever school yard wall affords most cover, sip my water, eat an energy bar and contemplate the long ago days when this yard rang with the sounds of children playing. Did these children realise that here in this seemingly impoverished landscape they had a vision of paradise. Or was I only fooling myself, me who has the wherewithal to live here today. Was their education a preparation for leaving, somehow I think it was. The school figures for the school beside the church show continuing decline. I leave behind the rusting ironwork of desks and debris, discarded in an old out house and I pedal on into the hill. My thoughts now turn to staying in the saddle as the pressure and resistance builds. I make it to the top. 207 metres the high point of the loop, and 25 kilometres completed. Stunning views away to the north, Bellacorick the newish wind turbines, replacing the old turf burning power station. Beyond the old power station is Sheskin, a veritable wilderness, a great expanse of bog and forest with few enough cultivable green grassy oases dotted here and there. A few houses, the last of a once great population, stand at the end of the road that runs by Bunaveela Lake. Sheep now outnumber all humans by thousands, on a hot summer’s day you can smell them. It’s a fast downhill, watch out for sheep crossing before entering Letterkeen Forest, part of which is in the national wilderness area. It is also worth noting that this is the biggest forestry plantation in the country. You could argue that it reaches from the eastern slopes of mount Eagle through Glenlara, away north through Ballycroy National Park and round to Bellacorick. A vast expanse of evergreens but the advent of wilderness status means that a great deal of the land will be allowed to return to a natural state as the years pass. Lios Na Gaoithe ring fort is accessible by a forestry track near the northern entrance. This ring fort was excavated many years ago and finds indicated trade with the Mediterranean. There are also two cist burials within the fort demonstrating a link to the earlier Bronze Age. It is also mentioned in the Táin Bó Fhlidais the north Mayo cattle raid one of the Queen Maeve stories. Paddy Kilroys house stands alone in the forest. A great accordion player and singer of traditional songs many from the area Paddy was a friend to all his death a loss to the communities all around the Nephin Mountains. At the car park sign you could detour for a moment and visit the Brogan Carroll bothy, renamed [unfairly I believe] the Robert Lloyd Praeger bothy. The bothy was built with funds from two Mayo Americans a good few years ago, and though Praeger himself walked these hills he was not the one who caused the bothy to be built. From the bothy you can walk the Bangor trail possibly the toughest hike in Ireland 24 kilometres to Bangor Erris, a wild and lonely track obscured in places, in others a rivulet, in still others a stony surface to turn an ankle. Back on the route the forest opens out and we are cycling through a rhododendron scattered setting. These plants are lovely when in bloom but not native to Ireland and really invasive in acidic conditions and here the bog encourages them to spread. Srahmore lodge is a fine stone building, though part of it is neglected and decaying, there was once a corn mill here, neither mill nor corn growing has survived. Lough Feeagh looms ahead and Croagh Patrick further still across Clew Bay. The route follows along the lakeside passed the old Shooting lodge that became the Guinness property and led to the founding of the Marine Research centre at Furness. Before Furness however there is a promontory fort with a chevaux de frise, and most importantly some archaeologists believe a Viking hut site on the promontory. Older still may be the bones discovered by local hill walker Michael Chambers. There are currently being tested by anthropologists and may date much further back in time than the Bronze Age. The cave location remains an open secret. One of the gems of the ride is the water stop after 38 kilometres. There by the roadside is a small construction with a pipe of continuously flowing water. Stop and drink, fill your water bottle before going on. Every day, locals, many of whom have their own wells, stop to fill containers here, for whatever reason this is the best drinking water for miles around. Enjoy. A sharp little climb takes you to Furness crossroads here you can divert down to the Marine Research Centre the oldest salmon migration records in Europe are continued here from the 1950’s I believe. Lough Furnace is the next lake in your sights. It has direct access to the sea and so is somewhat salty. You are about to join the N63 for a kilometre to Newport where you may have begun this loop. Before you go, a visit to St. Mary’s Friary at Burrishoole is worth a visit. Everybody refers to it as Burrishoole Abbey, it was established here in 1469 without papal approval, but that’s another story. 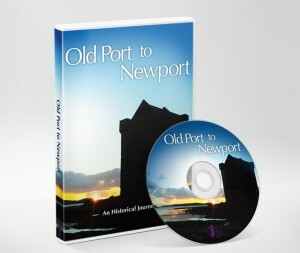 Newport has its own interesting history since its foundation in 1700. It has come under the influence of many pioneering business men. If you have a moment to spare visit St. Patricks Church on the hill, and see the magnificent Harry Clarke stained glass windows. To finish, let me tell you that I have a .gpx file for the route and if you have arrived here then you are welcome to contact me and I will forward it to you.